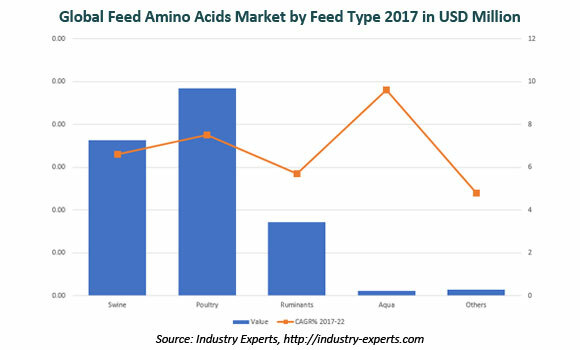 Industry Experts, Inc. appended a new market research report “Feed Amino Acids – A Global Market Overview” to their amino acids report series. Asia-Pacific is the world’s largest volume market for feed amino acids, estimated at 1.8 million metric tons (40.7% share) in 2017, which is also likely to record the fastest 2017-2022 CAGR of 8.5% in reaching a projected 2.8 million metric tons by 2022. Animal feed industry is the largest consumer of amino acids globally. Amino acids such as L-lysine, methionine, L-threonine, L-tryptophan and L-valine improve the nutritional quality of animal feeds by supplying essential amino acids that may be in low abundance in crude protein. In the field of compound feed production for livestock, feed amino acids are considered as indispensable ingredients which optimize the balance of amino acids in feed formulas, thus meeting objectives of performance, cost reduction and reduction of nitrogen excretion in to the environment. Consumption of Feed Amino Acids worldwide is slated to register a CAGR of 6.8% during the 2017-2022 period. Increasing pressure on the livestock sector to meet the growing demand for animal protein worldwide is driving growth of amino acids in compound animal feed production. The recent past has been witnessing a growing demand for animal protein globally for livestock, dairy and fish. This trend has been more apparent in the developing economies such as Asia-Pacific, as against the developed regions that have continued to be relatively stable. For addressing the increasing global demand for animal protein, it is imperative that the efficiency of converting proteins from feed to meat is improved, which is where amino acids come into play. Global volume consumption of Feed Grade Amino Acids is estimated at 4.5 million metric tons in 2017 and is projected to reach 6.2 million metric tons by 2022 at a CAGR of 6.8% between the two years. Poultry feed constitutes the largest consumer of feed amino acids globally with 2017 market share of 43.4%, volume consumption of which is slated to compound annually at 7.6% over 2017-2022 in reaching a projected 2.8 million metric tons by 2022 from an estimated 1.9 million metric tons in 2017. This global report analyzes feed grade amino acids comprising L-Lysine, Methionine, L-Threonine, L-Tryptophan, L-Valine and Glycine. The study also analyzes the animal feed types, in which feed grade amino acids are widely used, including Swine Feed, Poultry Feed, Ruminants Feed, Aqua Feed and Other Animal Feed. The global markets for the above-mentioned feed amino acids types and feed types are analyzed in terms of volume in metric tons and value in USD for 2012-2022 analysis period. This 313 page global feed amino acids market report includes 320 charts (includes a data table and graphical representation for each chart), supported with meaningful and easy to understand graphical presentation, of market numbers. This report profiles 15 key global players and 61 major players across North America – 10; Europe – 10; Asia-Pacific – 39 and South America – 2. The research also provides the listing of the companies engaged in manufacturing and supply of feed grade amino acids. The global list of companies covers the address, contact numbers and the website addresses of 227 companies.